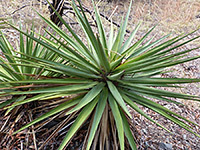 Yucca schottii is believed to be a hybrid species, a cross between yucca baccata and yucca elata; it has the grey-green leaf color of the former and the tall, branched form of the latter. Schott's yucca is found in southeast Arizona and far southwest New Mexico, either side of the boundary between the Chihuahuan and Sonoran deserts, in mountainous regions such as the Santa Catalina Mountains. The semi-flexible, flattish (concavo-convex towards the tips) leaves measure up to 30 inches in length and at most 2 inches across (widest in the middle); they lack any edge filaments but do have a sharp terminal spine. Old specimens form a trunk, protected by dead leaves, and branch a few times, reaching heights of up to 15 feet.